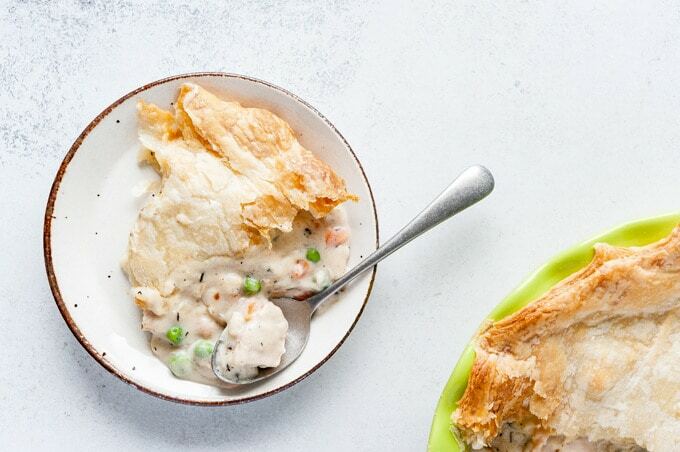 This Turkey Pot Pie is delicious, savoury, and creamy! It looks beautiful and impressive! It’s perfect for a fancy dinner party but it’s also very easy for a quick weeknight dinner. This post is sponsored by Lilydale as a part of their #locallylilydale campaign. All the delicious opinions are my own. Savoury pies are very popular in Russia. In fact, pies are some of the most traditional old Russian (not Soviet) foods, along with crepes (blinis), and various porridges. Gogol’s Dead Souls book is full of descriptions of food, including savoury pies. Don’t you just want to eat and feast after reading it? I grew up eating savoury pies, specifically Cabbage Pie. However, Russian savoury pies are very different from what most people would know as a pie in North America. Russian pies have very dry, not saucy, filling. 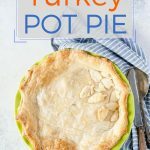 Pot pies, just like my Turkey Pot Pie, have delicious filling made with sauce. I remember exactly the first time I tried a variation of a classic pot pie. 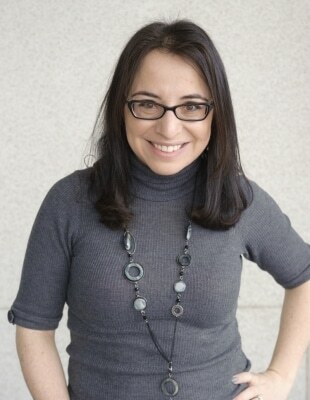 I was still in high school and although it did not look like any pie I grew up eating, I was hooked! 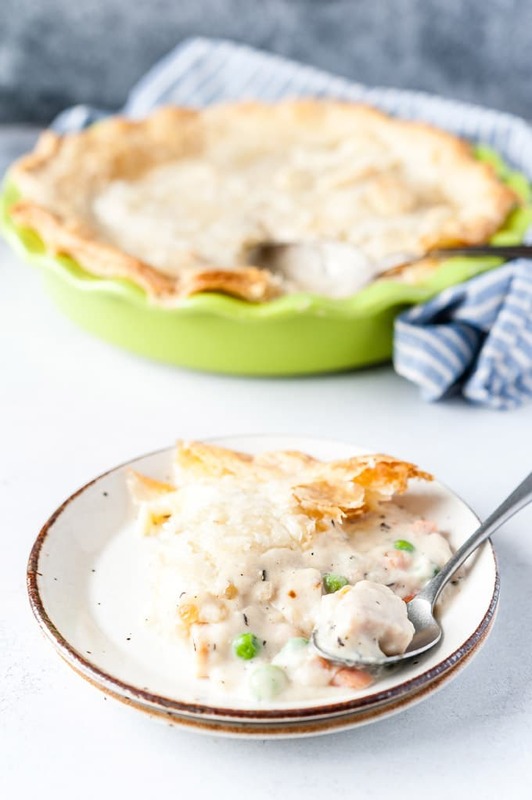 This Turkey Pot Pie is delicious and filling and creamy! It looks beautiful and impressive! It’s perfect for a fancy dinner party but it’s also very easy for a quick weeknight dinner. Yes, that’s right! 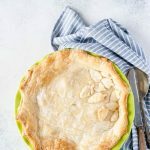 Pot Pies are often my go-to meals when I have no time to spend making dinner! 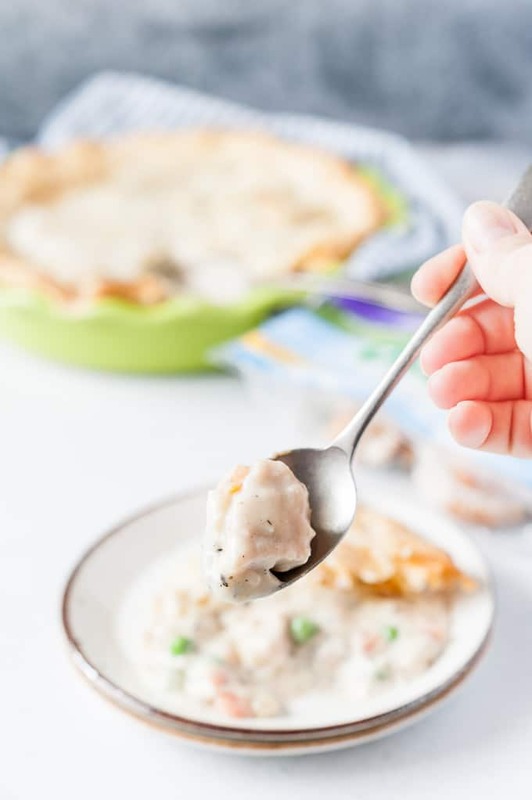 Turkey Pot Pie is a bit indulgent but also healthy since it’s using lean turkey and no cream or cheese. I love making my Turkey Pot Pie with Lilydale ready-to-eat Oven Roasted Carved Turkey Breast. It’s already cooked, seasoned, and carved, so it’s an ideal choice for a quick meal. 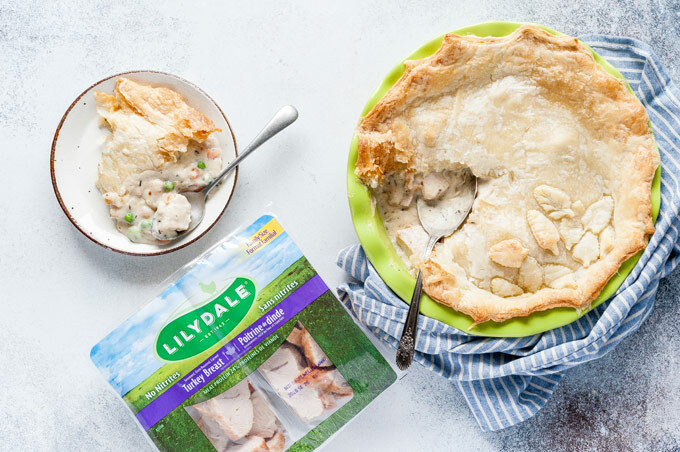 Why use Lilydale product in Turkey Pot Pie? Lilydale is currently celebrating its 75th birthday! 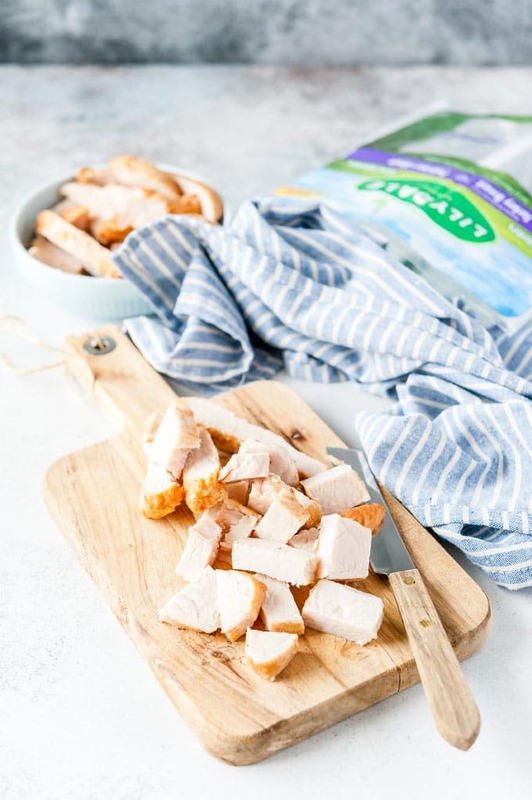 They are Canada’s premier poultry provider and I love using their products: from fresh poultry to deli, sausages, turkey bacon, ready-to-eat turkey and chicken, or even new frozen turkey boxed products, there will be something for everyone’s taste. I am usually a “from-scratch” cook, however, there are times when I need (and I want) shortcuts. 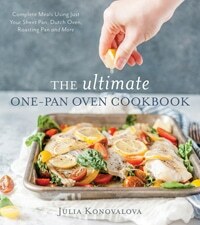 This is where Lilydale Oven Roasted Carved Turkey Breast is a delicious time-saver! I don’t need to cook my own turkey breast and worry that it’ll be over-cooked and too dry. I don’t need to spend time prepping and carving the turkey. I don’t even need to plan to make Turkey Pot Pie as the Lilydale carved turkey breast will last in the fridge for a few weeks so you don’t have to use it up right away. So convenient! Can you really make Turkey Pot Pie on a busy weeknight? Sure, you can! It’s actually really easy and convenient. All you need to do is make a classic white sauce and assemble the Turkey Pot Pie before baking. It really is that simple! TIP: If you really don’t have any spare time, try using a good quality store-bought white sauce, such as alfredo. This will mean that the Turkey Pot Pie could be assembled in a mater of minutes. 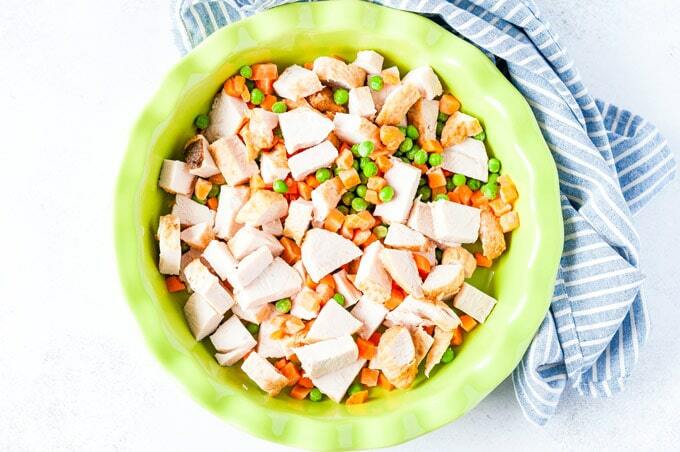 Use Lilydale Oven Roasted Carved Turkey for convenience, then mix it with frozen peas and carrots. Make an easy white sauce. 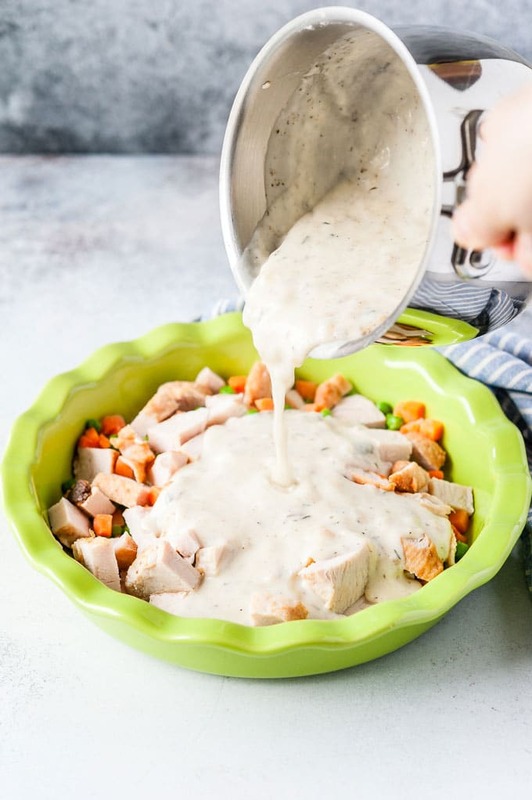 Pour the white sauce over the mixture of turkey and vegetables in a pie dish. Cover with thawed puff pastry. 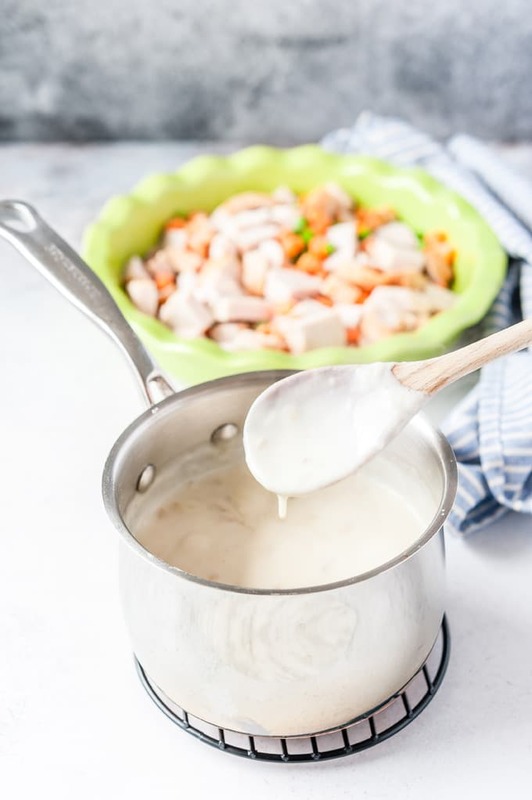 Making white sauce may seem a bit daunting but it shouldn’t be. It is actually a very easy process. The idea is that you cook a bit of flour in some fat, then you gradually add milk and the flour thickens it. Simple! I add an extra step of sautéing onions first. This step is optional but I just like onions in my Turkey Pot Pie. 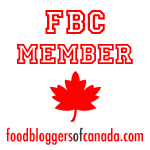 Traditionally, you need to use 1 part fat to 1 part flour. Which means, 1 tablespoon of butter to 1 tablespoon of flour or 4 tablespoons of butter to 4 tablespoons of flour etc. I, however, usually prefer to do it not by measurement but by sight. 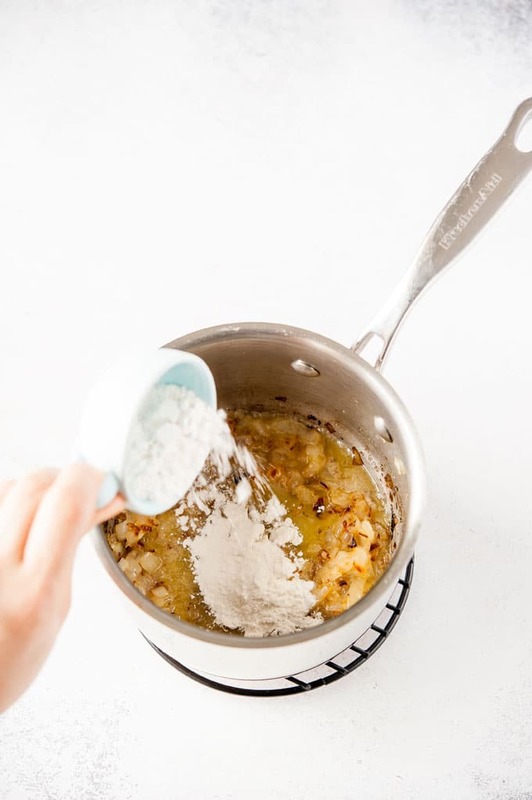 I melt the fat (sometimes it’s a combination of butter and oil, sometimes just butter) and then I add flour little by little until the mixture becomes very dry and all the fatty liquid is absorbed into the flour. In this recipe, it’s 1 part fat to 2 parts flour. 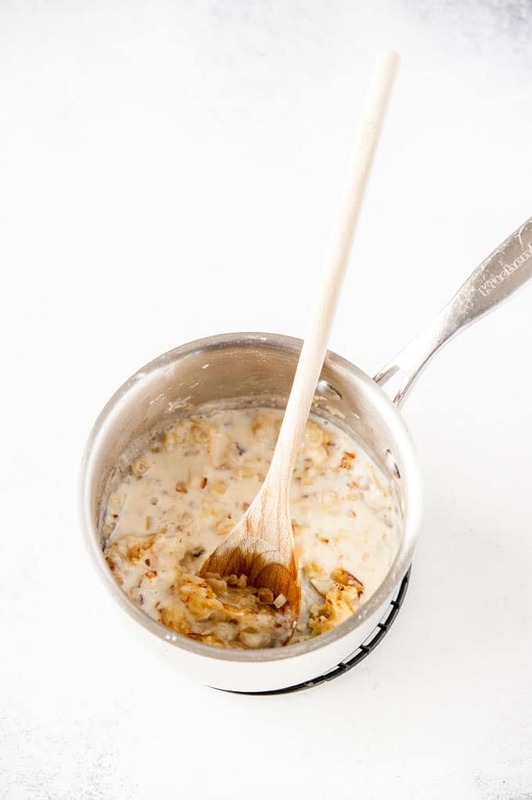 Once the flour is all dry and clumped up, start adding milk 1/4 cup at a time constantly whisking. Make sure that the mixture is smooth before adding more milk. After all the required milk is added, the mixture will look pretty thin, don’t worry, it’s supposed to be like that. Keep cooking whisking occasionally and the mixture miraculously will start to thicken! This will take about 5-7 minutes. 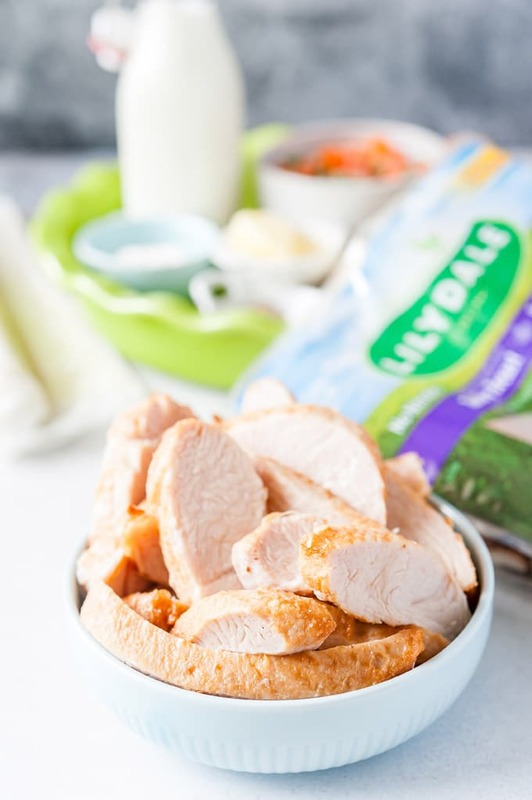 I love the convenience of using Lilydale Oven Roasted Carved Turkey, however, you can use your own turkey or chicken leftovers. I love the classic peas and carrots combination but I’ve use peas and corn, as well as peas and green beans. Basically, you can use any frozen vegetables that won’t cook into mush in 20-25 minutes in the oven. Feel free to use your favourite spices. I love nutmeg with white sauce so I use that. I also like thyme with turkey. Use your favourite poultry seasoning if you’d like. Frozen store-bought puff pastry is easy and convenient but you can use your favourite pastry. You could use pie crust (homemade or store-bought). Or you can even make biscuits and top the turkey with them. Since the filling is cooked, you’ll need to adjust the timing in the oven to make sure that the crust is baked through. Check out my Instagram account for the details on how you can win some FREE Lilydale Coupons to make your own #locallylilydale creation. While the oven is preheating, in a small pot, heat 1 tablespoon of olive oil on medium heat, add the finely diced onion and sauté for about 6-8 minutes until the onion gets soft and starts to turn colour. Add the butter and let it fully melt. 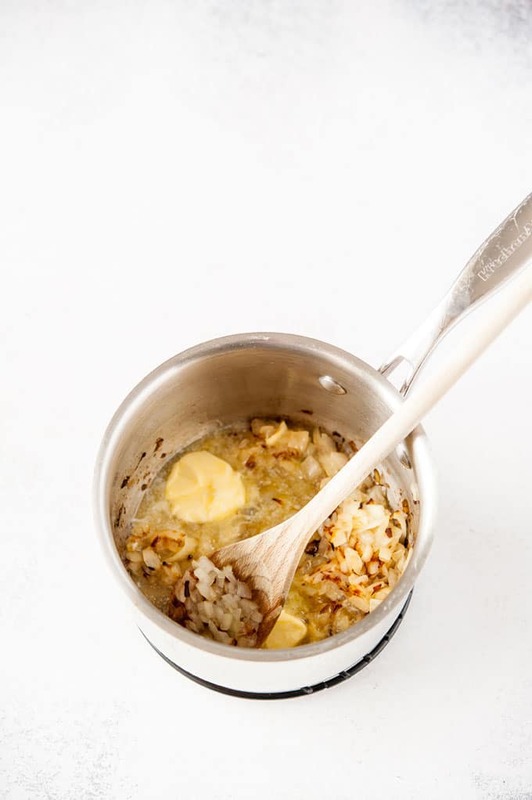 Add the flour and mix with a spatula until all the flour is absorbed into the butter. The mixture will be dry and clumped up. This is exactly how it's supposed to be. 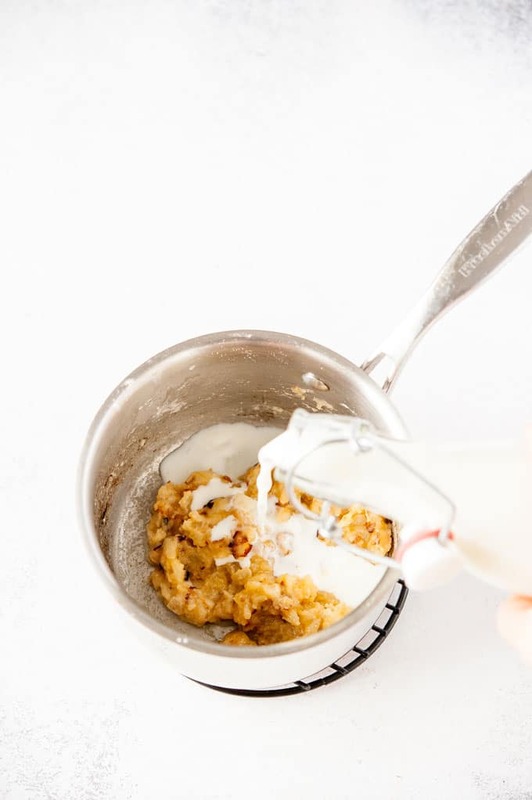 Constantly whisking, add the milk 1/4 cup at a time, making sure that the mixture is smooth after each addition. Once all the milk is added, the mixture will be very thin. This is how it's supposed to be. Cook on medium heat whisking occasionally for about 8-10 minutes until the mixture thickens. Watch the pot carefully as it goes from think to thick very quickly. 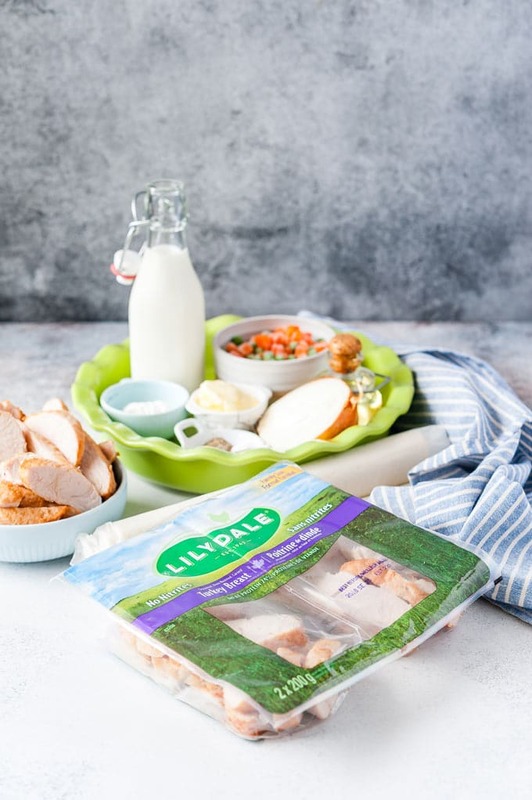 Meanwhile, cut the Lilydale® Oven-Roasted Carved Turkey Breast into bite-sized pieces. Arrange the turkey in a 9-inch pie plate. Add the frozen peas and carrots to the turkey and mix. Pour the white sauce over the turkey mixture and spread around so that it covers all the turkey and vegetables. Slightly roll the puff pastry so that it's big enough to cover the 9-inch pie plate. Cover the pie plate with the puff pastry and trim the corners. 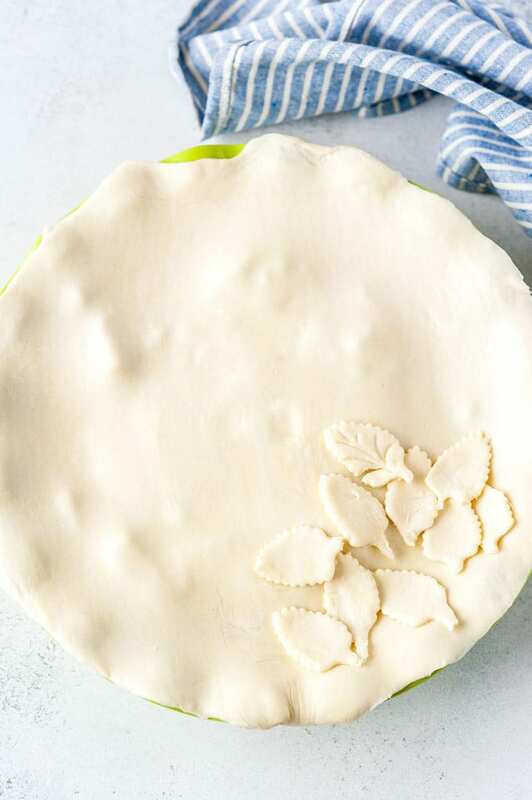 Optionally, cut out decorative shapes from the scraps of puff pastry and arrange on top of the pot pie. Poke a few holes in the pastry. 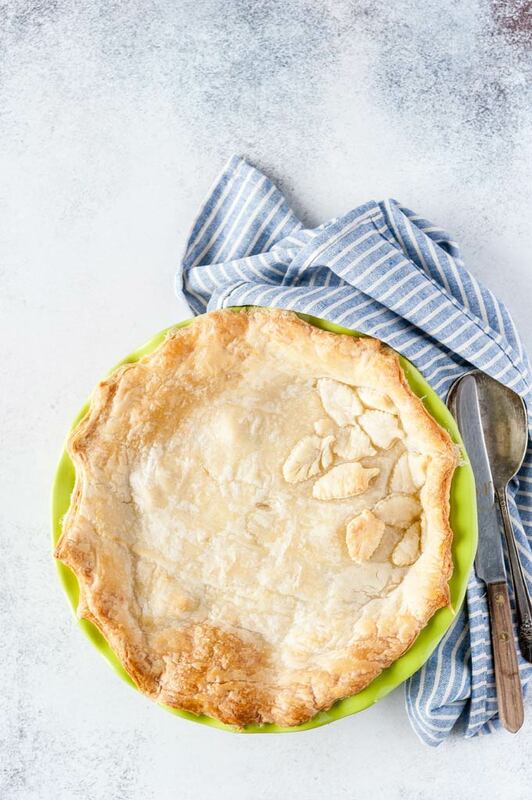 Place the pie plate on top of a parchment-covered sheet pan to catch accidental spills. Add the scraps of puff pastry to the sheet pan as you don't want to waste that yummy goodness. Bake for 20-25 minutes. Depending on your oven, you might want to rotate the pie plate so that it gets golden evenly on all sides.